EDINBURG — City leaders here have two decisions to consider today that promise to draw big crowds from fierce supporters. One of them involves children, the other, animals. Edinburg council members will decide whether to move forward with a proposed park on the east side of town or terminate the project. The problem: council members already signed a memorandum of understanding with the Edinburg Consolidated Independent School District and even broke ground on the property. The city partnered with the school district last year to build the Memorial/Eisenhower Sports Complex, which would house two baseball fields, one softball field, three basketball courts, a soccer field and a playground area among other amenities. The district donated land and pledged $2.3 million, while Edinburg promised a $1 million contribution for the 35-acre park. 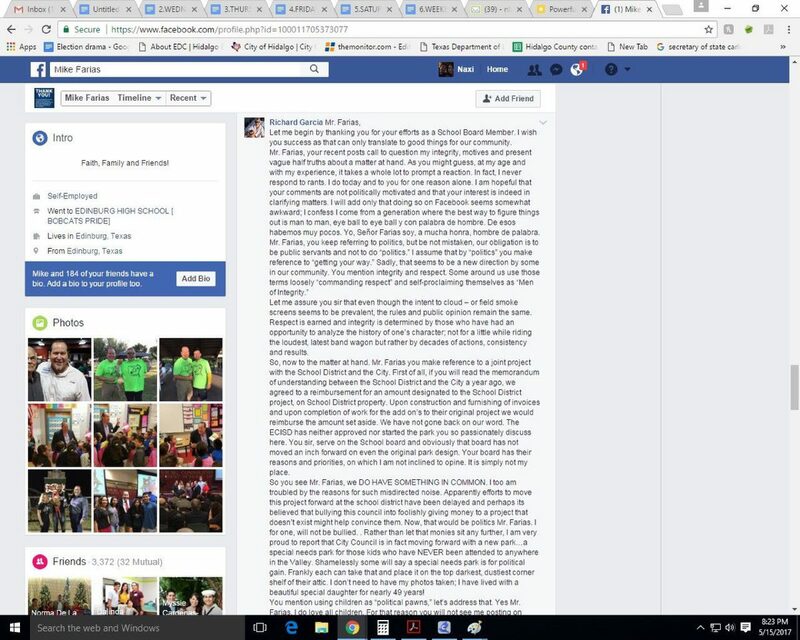 The screen grabs of Facebook posts detailing the discussion between Edinburg Mayor Richard Garcia and Edinburg School Board Member Mike Farias over the proposed Memorial/Eisenhower Sports Complex. A year ago, the school board members and council members met at the proposed site and ceremoniously broke ground. But construction never began, and leaders from both bodies are now pointing the finger at each other. And like many things do, the issue spilled onto Facebook, pitting Edinburg School Board Member Mike Farias against Edinburg Mayor Richard H. Garcia. 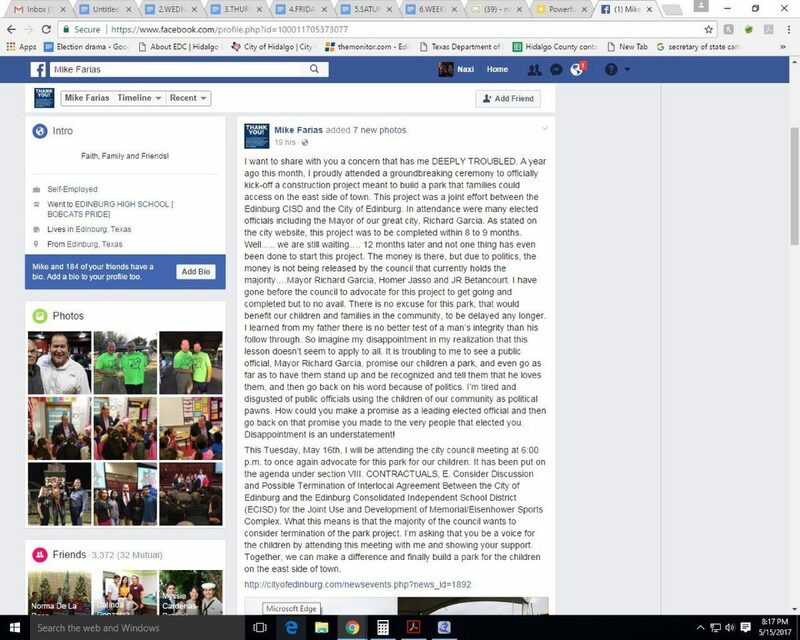 Farias wrote a post accusing the city council for the delay. “The money is there, but due to politics, the money is not being released by the council that currently holds the majority: Mayor Richard Garcia, Homer Jasso and JR Betancourt,” Farias wrote. 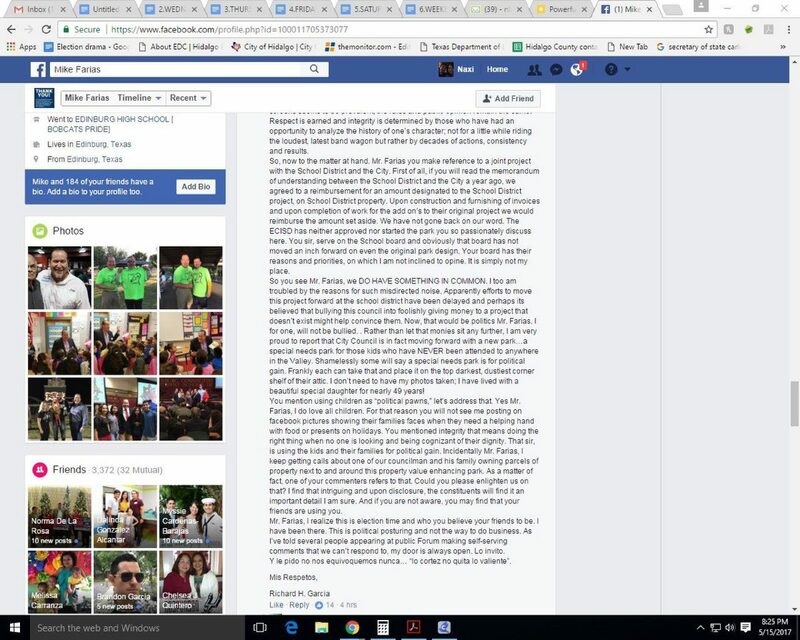 The post drew dozens of comments, including a lengthy response from Garcia, who also posted a picture of the MOU between the city and school district. The document indicates ECISD is the lead for the project and stipulates the city will reimburse the district when the work has been completed. The mayor also hinted at a new purpose for the allocated funds. “Rather than let that monies sit any further, I am very proud to report that city council is in fact moving forward with a new park…a special needs park for those kids who have never been attended to anywhere in the Valley,” Garcia wrote. As of Monday evening, the post has been shared by more than 100 other people. Council members will also consider whether to continue working with the animal shelter or break ties and expand their own services after the shelter requested to amend its contract with Edinburg. Under the new proposed terms, the city would pay a higher cost for the services. Palm Valley Executive Director Tim Ousley sent a letter to Edinburg last year letting them know the agency sought to amend its contract with the city. The nonprofit was struggling financially in 2016 when board members determined that the best approach was to establish a flat rate fee per city, Ousley said. Instead of paying a fee per animal, Palm Valley would charge a flat rate for its services based historically on the amount of dogs each city sends its way. In 2016, Edinburg animal control sent 562 animals to the shelter, and 85 of them were quarantined, Ousley said. Animals that go through Palm Valley are given a blood test, scanned for microchips, vaccinated and held for at least three days before being sent to the Laurie P. Andrews PAWS Center in Edinburg. The shelter currently charges Edinburg $120 per intake and $300 per animal placed under quarantine. Texas law dictates the shelter must keep and observe quarantined animals for 11 days. Based on those numbers, Edinburg paid about $83,000 for the services in 2016. The new contract, which would take effect immediately, proposes a flat-rate fee of $141,000 for a year’s worth of service. “We understand it’s a modification and a substantial increase…but we believe it’s an appropriate amount,” Ousley said. Most cities have already modified their contracts with the shelter, but a few remain unchanged, including Mission, Alton, Weslaco and Donna. Edinburg has its own holding facility, but does not provide all of the services Palm Valley offers. Ousley estimates it would be costlier for the city to expand its operations when compared with the proposed fee. “They would really have to expand their program to accomplish what we accomplish,” the executive director said. Council members will discuss the issue behind closed doors today.